My friends, Warren and Pete, and I had presented the school fathers with a proposal: we would produce Halloween shows a-la Frankenstein that would run about five minutes each, allowing fast turnaround for audiences of about 50 inside the school’s large visual arts room. We got approval. Warren donned a convincing homemade costume of high-rise “Frankenboots,” a grey jacket worn backward with the sleeves cut ragged, wax and magic-marker “stitches,” and a scary-as-hell monster mask. Pete played Igor, complete with prosthetic hunchback and facial makeup that alone would scare the hell out of a small kid. The audience was ushered into our darkened room and seated. I, playing the part of a latter-day Victor Frankenstein, wore a doctor’s operating gown and long, lead-lined X-Ray room gloves. We were set. I gave the spectators a spiel about how I could reanimate dead bodies, as long as they were fairly fresh, of course. Warren, in full monster regalia, was beneath a white sheet on the tilted “slab.” I fired up the Jacob’s ladders, powered on a whirring electric motor, and punched on the Tesla coils in loud, stuttering bursts. 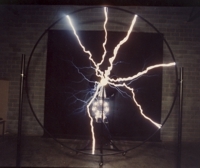 The noise, three-foot lightning discharges from the coils, and flashing lights startled and wowed the audience. The small kids were screaming and crying and bolting for the door; the parents were jumping from their seats, knocking over chairs, trying to control the stampede. The Monster, Igor, and I were sadistically laughing our heads off. The word got around. Soon the entire school was jamming the hallway, jostling to see us rejuvenate a dead body. All the other rooms and activities were left vacant. I don’t know how many shows we performed that night, but we were tired as hell when it was over. How to Make a Monster was a great success. We scared the crap out of kids and adults alike; we caused mayhem, maybe even messed-up some of the younger kids for life. For one night we were horror stars, and we’d never had so much fun at Halloween! 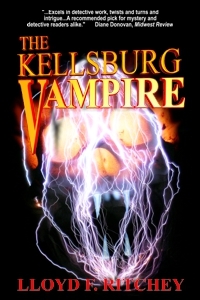 TODAY’S GIVEAWAY: Lloyd Ritchey is giving away a signed paperback of The Kellsburg Vampire. Comment below or email membership@horror.org with the subject title HH Contest Entry for a chance to win. The townsfolk called it a vampire. Or a zombie. Or just “monster.” Sheriff Greg Colvin didn’t care what they called it, as long as he could kill it. It started when two young boys explored the abandoned North Ridge military base north of town. They stumbled upon hidden tunnels, and a laboratory. And opened doors they should not have touched. Now something is killing people in the small town of Kellsburg, something that harvests flesh and spawns abominations. As Kellsburg descends into chaos, Colvin and a desperate group of volunteers enter North Ridge to stop the killings. In shadowed chambers echoing with the screams of torture and inhuman experiments, Colvin and his team confront a horror beyond their darkest nightmares. Colvin’s struggle to save himself, his town, and perhaps humankind itself, has just begun. We all see monsters and we all have nightmares, but Sheriff Greg Colvin is facing something all too real: a classic vampire problem in forces that are not only killing people, but devouring them and then creating living monsters. It doesn’t matter whether these creatures are vampires or zombies: what does matter is stopping the killing spree, but the classic vampire-killing devices don’t seem to work. It all began when a group of curious teens investigated an abandoned military facility, unleashing an unstoppable wave of horror. If Greg Colvin can’t contain the outbreak, it will move beyond Kellsburg’s borders to become truly unstoppable. “It’s called a pillbox. That slit underneath the window is the gun port.” Johnny plucked the water bottle from its holder and eyed the contents: half-full, and the morning was already sizzling in the August heat. West of their position, towering clouds were drawing close, their turbulent undersides scudding low enough to stir the surrounding forest of pine and spruce. The chain link fence, stretched tight between steel posts and crowned with spiraling coils of razor wire, ran from either side of the support columns and vanished into the swallowing woods. Lying on his back, he squirmed beneath the fence and tugged the packs behind him. Kip followed, his skinny form maneuvering quickly through the narrow gap. They were wearing camouflage shorts and T-shirts, and as they picked their way across a wide expanse of thorn vines, the black barbs clawed at their exposed arms and legs. The thorns finally released them into the shadow of the woods. The old entrance road curved across their path and quickly vanished, the trees piercing its ruined surface having buried it long ago under a carpet of pine needles and decaying limbs. “A little rain won’t hurt us. Besides, we could get inside one of the buildings and wait it out.” Johnny wished he had chosen another day to explore. But he had to be tough. This was his mission. He had planned this reconnaissance for days, poring over ancient newspaper articles and Internet photos of the wrecked buildings. The North Ridge Air Defense Base was considered dangerous, the subject of tall tales and stories about trespassers disappearing inside. After some mysterious disaster closed the base back in the sixties, the military had destroyed the roads and topped the fence with concertina wire. But if he and Kip pulled off this adventure, Spencer Middle School would be talking about them for a year. And his dad—Engineer Sergeant, 10th Special Forces Group, Retired—would be so proud. Once he got over being pissed. They walked through thick woods for perhaps a half mile, Johnny constantly checking the compass, lining up on a distant tree or rock outcrop. He had almost forgotten about the weather and looked up as a hissing breath of cold air dropped from the sky. Threads of lightning flashed and wormed through lowering clouds and a dull boom rolled from the west, spooking a dark knot of crows that burst croaking and cawing from a nearby aspen. Aligned north a moment ago, the compass now pointed south. Johnny carefully zeroed the bezel, but the needle suddenly wavered and swung left. It was as if a great magnetic snake were slithering around underground, tugging the needle as it moved. The ground burned blue-white and a cannon-loud crack blasted the woods. Another brilliant flash, followed by a stunningly loud report, brought him to his knees. Somewhere a branch crashed, and a frigid downdraft lashed his body, knocking him sideways. His teeth began chattering, partly from cold, partly from fear, and he found himself running away from the storm. “We’re gonna’ get hit by lightning,” Kip shouted, his voice verging on panic. A cascade of roaring silver tumbled from the sky and raced toward them from the west, churning the landscape into an impenetrable gray blur. They yanked off their packs and held them aloft, shielding themselves as ice stones the size of golf balls smashed through the wildly gyrating trees. The missiles sliced into Johnny’s exposed fingers and flashed beyond the pack-shield to pummel his shoulders. A stubby, rounded structure jutted from the ground a few feet away, startlingly out of place in the storm-darkened woods. Inset into the small dome was a door of riveted steel with a wheel in the center, like a submarine hatch. Johnny slung the pack over his arm, grabbed the wheel with both hands, and yanked it back and forth. The mechanism finally gave, and the door opened with a stiff shudder. A flash of lightning revealed a narrow chamber and a black hole through which dropped a rusted metal ladder. Branches cracked and split, the thrash of falling ice and staccato booms of thunder merging into a continuous roar. Johnny grasped the ladder and swung into the hole, felt his feet touch the first step leading down. Driven by a shrieking wind, hail banged hollowly against the open door and rattled into the cramped space like shrapnel. The concrete passage was cylindrical, about eight feet across, with no cracks or indications it might be unsafe. Light bulbs in protective metal cages hung at intervals from the curved ceiling, but Johnny didn’t even look for a switch; the power had probably been shut off for fifty years. He stepped aside as Kip crept down the ladder and landed beside him. Above, the wind keened past the open door, the sound accompanied by cone-shaped ghosts of lightning flickering down through the overhead shaft. Johnny’s flashlight beam probed the tunnel’s length and melted into darkness. “Let’s go this way,” he said, nodding to his left. A baseball thudded to the floor and rolled against the tunnel wall. Kip retrieved it, blew the grit off, and stuffed it back inside its zippered pocket. That stupid baseball. Kip took it everywhere. It was like a talisman or something, just because it was autographed. “Come on,” Johnny urged. “If we don’t see something cool right away, we’ll go back.” They’d come this far, and he wanted to keep his friend moving before he flaked out and they had to return with nothing to show for their effort. And no way was he going to explore the place alone. He moved deeper into the tunnel, the jittering beam of Kip’s flashlight joining his own. They had walked perhaps a hundred yards when the tunnel abruptly ended. Centered in the obstructing wall was another gray, hatch-like door. It squeaked and moaned on its hinges when Johnny tugged the wheel, but opened easily. Cool air rushed to meet them from the darkness beyond. The beacon of Johnny’s flashlight lanced into deep, open space. Sounds of the creaking hinges echoed from the walls of a huge chamber. “Oh, wow!” he said as he stepped across the threshold onto a metal catwalk. Kip brushed up beside him, and both flashlights danced into gloom. Twenty feet below, louvered machines studded with dials and switches clung to the walls, and consoles with old video monitors, dark and silent, huddled in raised islands across the floor. Cage-like copper coils big enough to hold a tiger gleamed dully in the center of the room, rising to metal poles that vanished into shadows high above. Kip leaned forward against the railing. “Beam me up, Scotty.” He cupped his hands and shouted a loud “Hey!” the distorted echoes slapping back in quick succession. “Shhhh!” The reflection of Johnny’s own whisper sounded eerie, as if someone on the opposite side had admonished him to be silent. They clattered down a dizzying spiral stairway and stepped onto a dusty concrete floor. More of the submarine-style doors, all of them shut, were inset here and there along the room’s curving perimeter. High on the opposite side, two rows of black glass looked out from an observation or control room. Chairs were overturned, and old papers, coffee mugs, and moldering jackets lay scattered around the room. “Screw you. I give up.” Johnny grabbed the door’s latching mechanism and turned it. The door groaned open with little effort, revealing concrete steps that fell some ten feet to a wide tunnel. Elevated on stubby trestles above the tunnel floor, the railroad tracks emerged from the main chamber, followed a sharp curve to the left, and arrowed into darkness beyond the flashlights’ reach. A moist, deep-throated growl issued from the tunnel and echoed ominously in the still air. The boys flinched back and shot their flashlight beams deeper into the tunnel, probing for the source. The lights flickered from the surface of water rushing within a broad channel and danced across a high, arched ceiling blackened with mold. A hundred feet ahead, beyond a steel handrail, where the lights began to fade, they could see a wide circular pool at the convergence of three canals. At the pool’s center, the water spun around and around, spiraling into a hole of infinite darkness. The funnel’s silken mouth widened and contracted every few seconds, making a hollow grumble that made Johnny’s neck hairs stand on end. Johnny forced his courage up, went down the steps, and began walking alongside the canal, its liquid voice murmuring a vague warning. About twenty yards into the tunnel, they turned right and climbed a series of concrete steps to a steel door standing halfway open. Riding a faint current of dank air, the smell of burned machinery, chemicals, and mold drifted from the dark room beyond. “It’s a lab,” Johnny said as he stepped inside. Their flashlight beams glided across rows of electronic equipment and gleamed from tables loaded with tall glass cylinders and coiled chemical apparatus. Johnny walked between two long tables, fascinated by the glassware and interconnecting electronics. A fat container, resting at eye level, held something suspended in liquid. 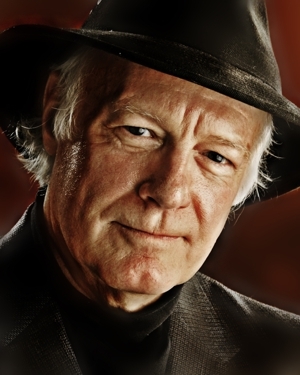 Leaning in close, he pointed his light into the amber murk. The bulbous object inside had convolutions and ridges like a strangely eroded landscape. He jumped back as the shock of recognition hit him. “Brains,” he whispered, fear building like a tidal wave. He swept the flashlight along the table, the beam illuminating row upon row of similar vessels, each filled with the same amber fluid, each with a wrinkled gray mass drowning within. He started at the sound of Kip’s voice. “Totally sick.” Kip was rattling and clinking through instruments and lab tools. “Check this out.” Kip stood on the opposite side of the long table, arm extended across its top, cradling something in his hand: a glass cylinder sealed with a metallic cap. Johnny lifted it gingerly and held it before the flashlight. Suspended within the tube was a curved disk of plastic or glass about two inches across. A number of stiff, silvery filaments of varying length, some about four inches long, stuck out of one end of the disk, giving it the appearance of a jellyfish with a flattened body and straight, skinny tentacles. Then the light came to rest on another object in an open space beyond the lab bench—a metal table beneath a cluster of dead overhead floodlights, a disturbing bulk covered by a rotted sheet stretched upon its surface. Although the rational part of Johnny’s mind was sending powerful signals to flee, to run, to exit the door, up the stairs and through the tunnel to freedom and light, a siren’s voice of curiosity drew him on. Heart thudding in his ears, he walked closer, swept his light along the sheeted mass, and stopped as the beam glinted from a silvery metal contraption at the uppermost end of the table. The apparatus resembled an oversized helmet, but with odd attachments and wires that coiled into it from some kind of electronic device. 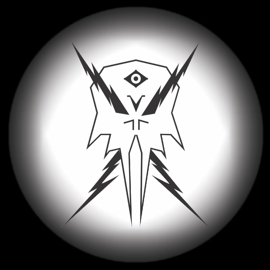 And inside the dark cavity of the helmet, brightened by the flashlight’s trembling beam, rested a grinning human skull. Johnny’s guts froze. He was looking at an operating table, and a body was strapped to it, its fleshless head pinned and pierced by the helmet, or machine, or whatever it was. The agonized jaw yawned wide. Black filaments branched from the hollow eye sockets, as if someone had taken charcoal and scrawled heavy lines branching like veins over the forehead, back along the temples and from the screaming mouth. With a sudden snap and a bright, lingering flash, beyond the bared teeth, inside the darkened helmet with its wires and screws and metal rods, the skull glowed from within, from where the brain should be—glowed orange and red and flickered like an enraged thunderhead. It happened so very quickly, and Johnny screamed, his body involuntarily twisting to run. Then he felt Kip’s fear, heard his terrified wail from the opposite side of the lab table, and looked back. The skull rattled against the metal pins, the cranium pulsed with reddish light. And through the black eye sockets something phosphorescent came. But Kip was trapped. His only route to freedom was past the operating table and its terrifying burden. Kip’s feet met the floor and he bent down to make a leap; then the glow—bright enough to throw stark shadows from the tables and wiring and coiled glass tubing—crept across the floor toward him. “It’s on me…on me!” Kip belted out a sound like Johnny had never heard in his entire life, one that made the best screams of horror movies and war films seem phony and contrived, and collapsed into the blue aura throbbing at his feet. There rose a hissing, snapping sound, like he was being burned alive. Then Johnny saw more of the candescent forms scurry from beneath the table, swarming after him. He turned and fled, galvanized by the most consuming terror he had ever known. He almost collided with the door as he pelted through the opening and down the concrete steps. His left heel lost traction on the damp concrete surface and he fell. The sharp steps hammered his back, and as his arms flew outward to slow his descent, the flashlight leapt from his hand. He felt himself roll across the narrow walkway, and realized with horror that as he crawled after the flashlight and his hands and knees dropped onto a steep incline, that he was tumbling toward the canal’s dark, rushing water. Cold engulfed him as he plunged in. He forced his head above the surface, coughing, gagging, feeling the tenacious grip of the current. The flashlight’s hazy greenish eye raced away below him, glaring up from the depths. The light suddenly made a rapid pinwheel spin that briefly illuminated a smooth, transparent, tornado-shaped tube before it winked into a hole of utter blackness. Then he heard the growling, sucking noise. He turned and swam with every furious ounce of strength he could muster, kicking and thrashing against the relentless current. His hands struck the concrete ledge, grasped, clawed, lost purchase. The funneling sound grew louder. The whirling black tube drew him closer. And in an interminable, agonizing moment of blind, shrieking panic, he began to spin, the hollow vacuum-roar thundering within his chest, his explosive screams strangled into stuttering liquid sobs as the vortex snatched him down. The Universal monster movies definitely did something right. They gave us a whole visual language to play with when talking about the classic monsters. Some shades of Ray Bradbury here too, I think. Thanks for sharing!